December 4, 2017 - The Palestinian Boycott, Divestment and Sanctions National Committee (BNC), the largest Palestinian civil society coalition and the leadership of the global BDS movement, welcomes the decision of major social movements, organizations and unions in Colombia to join the BDS movement. We also express our solidarity with the Colombian people and call on supporters around the world to intensify international solidarity with the struggle for human rights and social justice in Colombia. Today, more than ever, mutual solidarity between our peoples is essential. Unfortunately, according to Amnesty International, after one year of the peace agreement between the Colombian government and the Revolutionary Armed Forces of Colombia (Farc), homicides, attacks and threats against human rights defenders and community leaders in Colombia continue to grow. Peasants, blacks, unionists and indigenous people are the most affected groups by these serious ongoing human rights violations. The UN Assistant Secretary-General for human rights has recently urged the Colombian government to address the impunity for human rights violations and to stop the killing of human rights defender and community leaders. We, Palestinians, understand what is to live in a reality in which expulsions, killings, arrests, dispossession of land, and political persecutions are aspects of daily reality. After all, Israel’s regime of apartheid, settler colonialism and occupation has been oppressing us and challenging our existence for seven decades with such practices. However, we also understand the importance of not giving up and standing with each other. Our struggle for justice, equality and freedom is deeply connected to other struggles around the world, such as the Colombian people’s pursuit for peace and human rights. The fact that Israel’s policies are also been exported to oppress others, such as our fellow brothers and sisters in Colombia, only strengthens our commitment to mutual solidarity and support. During the recent visit of the Israeli Prime Minister Benjamin Netanyahu to Bogotá, Colombia’s president Santos has underlined the government’s commitment to continue and strengthen cooperation between the two states in the military and “security” sector, which means to further Colombia’s import of brutal Israeli military methods and technologies developed and tested in Israel’s wars of aggression, siege and repression against the Palestinian people. 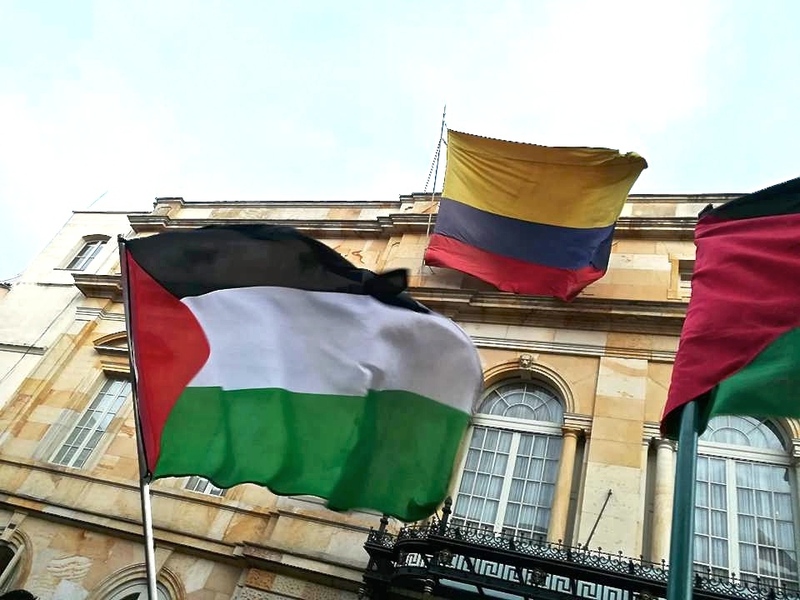 An Israeli study has projected that the recently ratified Free Trade Agreement between Israel and Colombia has the potential to increase Colombia’s imports of Israeli weapons, ammunition and related technology by 28,7%. The FTA will also benefit the import of Israeli unsustainable agro-business technologies, including Israel’s water apartheid systems, which will further the corporate takeover of farm lands and facilitate the privatization of water in Colombia. Israel has been a historical partner of military dictatorships, death squads and human rights violators in Latin America, and in particular in Colombia. Military ties started in the 80s and saw numerous Israeli security firms train Colombian military and paramilitary forces. As a Colombian senior defense official once put it: “Israel’s methods of fighting terror have been duplicated in Colombia.” The horrific death tolls and violations of human rights perpetrated in Colombia leave no doubt about the urgent need to cut military ties with Israel now. Since Israel is one of the key actors of this current globalized system of oppression, the BDS movement is not only an effective and strategic tool for us to pressure Israel to respect international law and Palestinian human rights; it is also a way to fight militarism, racism, and human rights violations internationally. As a people that shares with the Colombian people a decades-old struggle for respect for basic human rights and a just peace, we strongly support Colombian progressive movements in opposing the import of Israeli war and repressive technologies more freely than ever. In such a historic moment we all need to stand together to make a just peace possible and stop any actors that profit from ongoing armed conflict and repression. We are committed to strengthening our solidarity with the people of Colombia in their pursuit of a just peace and redouble our efforts to enact a military embargo on Israel now.